Aside from our sunshine-advantaged friends in Florida, Texas, Arizona, and the like, winter is a tough time for cigar smokers in the U.S. Unfortunately, winter is coming fast. Humidors will require extra attention to keep from becoming too arid. Shipping cigars will become a riskier endeavor. And, worst of all, the wrath of government-imposed smoking bans will hit the hardest as aficionados clamor for rare indoor refuges from the cold. In the not-too-distant past, back when I was living in Northern Virginia, there was no statewide smoking ban. This freedom resulted in options. Many bars, restaurants, etc. on their own accord were either completely smoke-free or not welcoming of cigars. I always respected that. But I also appreciated the less-numerous venues that catered to cigar smokers. In the winter, they became havens to escape the cold. What a novel system. People who wanted to smoke or be around smoke could. People who wanted a smoke-free environment could have that, too. Isn’t choice great? — Tough it out and smoke outside. — Severely limit your smoking to fewer cigars and/or smaller cigars. — Purchase a paid membership at a club that allows indoor smoking. — Smoke at a tobacconist (cigars you purchased at said tobacconist). — Equip some portion of your home for smoking. I’ve done the latter, though I still regret the fact that I had to do the latter. I lament that gone are the days when you could cozy up to the bar at a steakhouse for an after-dinner smoke. I hang my head because I know there are destinations in my neighborhood that would allow cigar smoking if the government didn’t prevent them from doing so. I assume you share these concerns. So what are your plans for the winter? In the winter I'm usually relegated to short sticks or just going over to the cigar shop, buying a single, and smoking it there. I smoke a lot less in the winter. Here in MN it gets cold. I will tough it out and smoke outside from time to time. 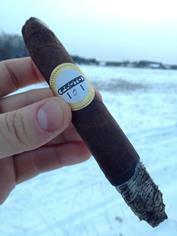 When the temperature drops below freezing it takes a lot of the enjoyment out of a cigar. There will be a few days set aside to hang out at a B&M however. That is a tasty looking Proto. I am looking forward to this years additions! Lucky me, i am allowed to smoke pipes inside during the winter, and our city has some great smoke shops to hang out with great selections. Push comes to shove my silverado has music, whisky, cigar boxes and lots of heat. Ah, just another advantage of relocating to the Philippines — no winter.